This has been a great year for classy, cutting-edge mobiles. It began with the Sony Xperia Z. Since then, we've seen the Samsung Galaxy S4, HTC One, HTC One Mini, BlackBerry Q10, Nokia Lumia 925 and Nokia Lumia 1020, and now the iPhones 5s and iPhone 5c. How do you choose? Well, there's one more premium handset in the mix, Sony Xperia Z1. 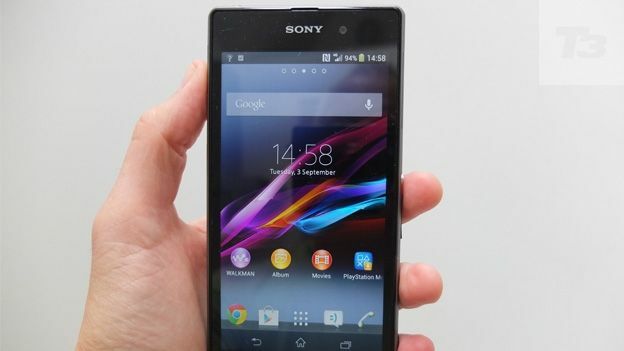 The new handset builds on the success of the Xperia Z, with the same 5-inch display and similar metal frame and front-and-back glass design language. It's even marginally bigger than the Xperia Z, an already hefty handset. The dimensions, for those who like stats, are: 144 x 74 x 8.5 mm. That's taller and wider than the Xperia Z, but a touch thinner. It's not light, either, at 170g. But the benefit here is that the corners are smoother. The Z's edges were slightly sharp but this is much gentler so it makes it much more comfortable to hold. It's a more sumptuous, confident build quality than the Z. It's still pretty big and those with small hands should probably look elsewhere or be prepared for pained hands caused by stretching fingers across the glass. The aluminium frame is demure and understated – you barely notice it but for the carefully-detailed power button, the same as the one on the Xperia Z. And further down the right hand edge there's a new button, a dedicated camera shutter, hinting at the photographic focus of this phone. The Z1 is available in three colours – white, black and purple. Black is the subtlest, white gleams and purple is gorgeous. Sony says the purple was arrived at because it's a combination of red which is warm and reassuring and blue, which is a colour that excites. Whatever, it's a very nice purple, which should be enough. This is a well-built, beautifully styled handset. Only the iPhone 5 and HTC One better it in the design stakes. Like the earlier Xperia Z, this phone is waterproof. Like the Sony Xperia Z Ultra, the massive phone-tablet hybrid with its 6.4-inch display, this one has a clever headphone socket that keeps the water out without the need for a flap on it – the speaker on the bottom of the phone is the same and though it's okay, it doesn't sound that great. There's also no flap on the magnetic charging socket, a slightly more noticeable unit than on the Xperia Z. If you don't have the charging dock you'd need for that, you'll have to peel back the flap on the micro USB slot. Which is also what you need to do for the sim card and microSD memory card. These little flaps are annoying but a waterproof phone is highly desirable – it's one of Sony's most useful innovations, as anyone who has ever texted in the bath and dropped it will ruefully admit. Since so many extra features these days are of questionable value (is the humidity sensor on the Samsung Galaxy S4 really a must-have?) Sony is right to stick with one that's as appealing as this. The Z1 has a screen that's similar to the frankly excellent one on the earlier Xperia Z. Sony says that while the previous one had some technology gleaned from the company's TV division, this one has even more. Whatever, it looks great: rich, detailed, colourful and great for smooth video playback. Sony bundles a short video to show off its screen skills. It's worth a gander as it's pretty impressive. The camera is one of the Z1's biggest advances. While most cameraphones offer 5MP or 8MP sensors, the latest models reach 13MP – or in the case of HTC opts for fewer but bigger pixels. There's one camera with 16MP, the Samsung Galaxy S4 Zoom. But Sony changes the game by shooting up to 20.7MP. That means the only current phone with more pixels is the Nokia Lumia 1020. That has 41MP but is a thicker package. Competition apart, Sony has worked to make this sensor and the aspherical lens array that goes with it. The result is a tremendously capable, powerful camera that is fast, responsive and delivers extremely good results. It defaults to a Superior Auto setting which shoots at 8MP. This means the camera manages lossless zoom, that is, you can zoom in three times before the camera is unable to create an 8MP image. Of course, you can shoot at the full 20MP resolution by switching to Manual. There's also the very cool Info Eye setting. You need a data connection for this but it allows you to photograph certain objects and see data associated with them. This means you can find out what that landmark building ahead of you is, or the vintage of the wine the sommelier has just brought you. It's simple to use and there's even a clever way to zoom in on just the bit of the scene you want it to recognise. The Xperia Z1 has an even more powerful processor than the more-than-decent chip in the Xperia Z. It's powered by the quad-core Qualcomm Snapdragon 800 processor. It's a 2.2GHz model and as a result it's very speedy whether you're playing games, browsing the web or just, you know, opening emails. Although it first launched with Android 4.2.2 Jelly Bean, Sony has done a stand-up job of keeping the operating system updated. As it stands, you're able to run Android 5.1.1 Lollipop smoothly on the Xperia Z1, which has enough modern features to keep you ticking over. The more a phone does, the quicker the battery burns. So one great advantage of a monster handset is that there's room for a big battery. This one's a 3,000mAh cell and is enough to see you through the day. Of course, Sony is known not least for its Battery Stamina mode where you can set rules which automatically reduce some wireless connections, for instance, when the battery level drops below a set figure. This is a neat feature that helps counteract the power-hungry processor. The camera is good, though Nokia's Lumia 1020 will give it a hard run. And though this phone is too big to suit every hand, if the size isn't a problem this is a very powerful, fast, highly enjoyable handset.